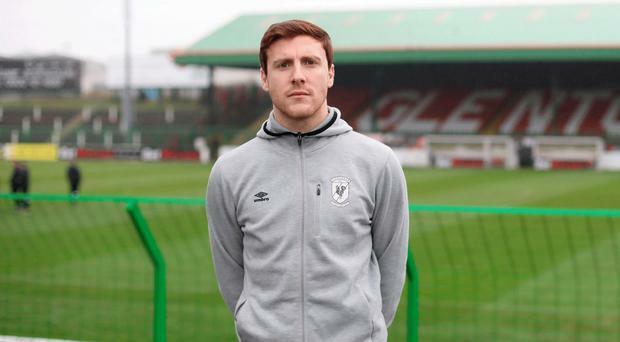 In the latest instalment of our popular series, Glentoran defender Willie Garrett discusses how his girlfriend helped him through two serious injuries and why his childhood toughened him up. Q. Take us back to when you first got into football. What are your earliest memories? A. My earliest football memory would probably be playing for Brooklands Primary School, around P6, and I remember my mum and dad coming to watch me in a match we won 2-1. They were standing with a group of other parents and watched as I completely nailed this lad who had the ball in a tackle, and I remember my mum screaming because she thought I had broken his leg. She's actually never been back since, it scarred her so badly. Q. Does that upset you, to know your mum is not watching you from the stands? A. Not really. My dad is fairly selective about which games he comes to as well, having attended often in the early days but only coming to big ones now. My girlfriend Amy comes to lots of them. Dad would go to Linfield games, he's from the Shore Road so would have been a Crusaders fan growing up, and enjoys those. I'm just happy enough to get on with it. It's nice to know Amy is at the important games. Q. Did Amy have an interest in football before you got together? A. No, she hadn't a clue! Still doesn't really, but she knows it makes me happy so she'll come to as many games as she can. Q. Can you sum up the importance of Glentoran in your life, having joined at such a young age? A. Very important, I've been there since I was about 10, and I'm the youngest player to come from the lowest rung of the academy, through to the first team and win something when we won the Irish Cup. I got into the first team in 2013 but overall I've been there quite a while. I just want to win, I'm a winner, and playing for the team you support is really good. There have been arguments in the dressing room let's just say, over the past couple of years. Whenever the Glens were successful, there were a lot of supporters in the team, and I think that's important, to have that Glentoran blood in the dressing room. Q. How do you balance working full-time with such an unwavering commitment to football? A. Sometimes the enthusiasm for football dips, when the winter starts to set in and training is always in the dark, but it's a real passion. I work full-time for Ulster Bank, which is helpful because I have fixed hours but there are lots of things changing in my life. Amy and I just bought a house at the end of July, and even though it was fit to move straight into, I reckon we'll get our teeth stuck into a project in the future. She had everything bought for the house before we even got the keys, she's mustard but organised. We're in Killinchy now, out in the country which is taking a little bit of getting used to, but it's quiet and pretty. A big difference to growing up in Ballybeen! Q. What are your memories of your childhood? A. I suppose it toughened me up a bit - mind you, I've only one yellow card so far this season so I must be mellowing as I had about seven by this stage last year. I was born and bred in Ballybeen and I had many good memories of growing up there, but it was also pretty terrifying at times as a young lad. Back when we were younger… well, you think about the things you saw as a kid and it's quite shocking. I remember one time, I had just got back from a family holiday in Florida and I had taken a walk to go and see my friend. I heard a man screaming, or kind of squealing loudly, and thought 'what on earth is that?' Then I saw this guy crawling out from an alleyway with blood streaming behind him and I realised he'd been shot in the knees. I ran into my friend's house and his mum called the ambulance, I was only about 10. But you know, I wouldn't change it for the world, I really loved being there. I think growing up in more deprived areas gives you two avenues, you can either take the wrong one or you develop this resilience and strong work ethic, because nothing has been handed to you. I work 40 hours at least every week, plus stay committed to football, and it's great for me. I could have fallen into the trap of an estate society, I saw so many others do so. Q. Who do you credit for steering your life in such a positive direction, or were you always the sensible one? A. I think I only started to become sensible when I met Amy. I was a bit of a rascal growing up but I suppose I had to turn a corner at some stage. A. I met her in Belfast on a night out, like so many who do these interviews! She will argue I messaged her first, but I am pretty sure she messaged me, and she's too busy with work to be here and defend herself now. That was about six years ago now, so she's pausing every time we walk past a jeweller's to put me under a bit of pressure. But I couldn't be happier, I love her to bits. She knows me, she can read my emotions and knows how to treat me after a match. If it's not gone our way she may have to cancel our plans for that Saturday night, because I've gone for a couple of pints in the social club after and then I'm just no longer in the mood to go out. She is a cardiac physiologist and is very hard-working, very talented and I hugely admire what she does. Q. Let's talk about those unforgettable Irish Cup wins for the Glens in 2013 and 2015. What was the atmosphere at the club like at that time? A. I missed out on the 2013 one because I had only just broken into the first team, when Scott Young signed me but I went out on loan to Lisburn Distillery for the first round of the Irish Cup, so I was cup-tied and couldn't play. I came back at the end of the season and the Glens were in the final, so I was along supporting them in the stands. I may have been suited and booted, but I didn't feel part of it at all. I had been out on loan for six months and was thoroughly detached from the win, I could only be happy for them and not really celebrate it personally. That's why the 2015 win means so much to me, because I can say I played a part. For the club, of course, both mean a huge amount. It was the closest the club came to pulling the shutters down, given the financial troubles we had. Q. And how about now, what's it like at the Oval? A. I am just glad playing football and to have a new management structure in place. Ronnie [McFall] is in, plus Smicker [Gary Smyth] and Leeper [Paul Leeman] coming in has meant there's a feel-good factor here. The numbers are up every week and we're starting to get results. It all comes down to where you are at the end of the season, they're a demanding bunch, so everything hinges on where you finish. You wouldn't want it any other way, but we'll see come the end of the season. Q. Anyone following your career will know of the trouble two cruciate injuries in your knee caused for you. How do you feel about that time, and how are you now? A. Even after two years of rehab I still have to work on it around two or three times a week. I sit at a desk all day in work so sometimes on a Sunday when I attempt to get up after a game on Saturday it is horrendous, I just can't get up. So now and then I'll ice it, but it's okay. I remember it was coming up to Christmas in 2015, just months after the Irish Cup win, that I did the first, up at Solitude. There was no contact in either, which to be honest just makes it worse. The ball went over my head and I turned, saw Elliott [Morris] had it in his hands but turned to make sure nobody was running onto him and I just heard 'snap'. Barry Holland was right back and I was left side, and he heard the snap from the other side of the pitch. He came over to me and said the colour had drained from my face as I lay there in agony. I did my cruciate meniscus, snapping the whole thing. I had to get some of my meniscus shaved off and a part of my hamstring tendon was used to create the new ligament. Me and Mackers [Stephen McAlorum] had the operation the same day, since he had done his shortly after me. The rehab was easier I think, because we both went through it. Things were going okay, and I had got to about seven months into a nine-month recovery. I remember being in training when I probably shouldn't have been, and I ended up going in for a tackle on Ciaran Caldwell. It was at an awkward angle, and the boys just stopped and looked, I probably should have stopped but I didn't, and jarred the knee, so that was another seven months out of training. I needed another operation, two cruciate operations and I also had to have a bit of my shin shaved to fill the gaps from the last operation. It was a nightmare but it's feeling good now. Q. Can you remember returning to the field after two years out? A. My first game back was at Solitude and I remember a really sick feeling in the pit of my stomach but it was great to get it over and done with. That was at a time when players were still getting used to the artificial surfaces, because they had been fairly notorious for causing injuries. Q. Was it ever touch-and-go as to whether you would recover? A. With the second, yes. I thought then about giving it up. The first time I did it I was motivated to come back, but the second time I had become so disheartened, and rehab is not a happy place to be. The first time I was told nine months, the second time I was told it would be at least a year and that was optimistic. I'm guaranteed a knee replacement when I am older, and I will have arthritis, the consultant advised me to consider giving it up then. Q. Do you think their prognosis will be correct? A. They're certain that I will have arthritis and a knee replacement when I am older. I went through some seriously dark moments throughout that second recovery, I don't know how Amy stuck with me to be honest and I am so fortunate that she was there for me, likewise Johnny, our physio. Mackers was a big help the first time, but it was so tough the second time around. Working all day, into the gym for a couple of hours of rehab and then knowing I'd be sitting in the stand every Saturday - at a time when Glentoran were coming under real criticism over results and there was a revolving door for managers - was so hard to deal with. Q. What's it like to sit in the stands, unable to influence what happens on the pitch? A. Not being able to help out is frustrating. If I wasn't playing football and even when I do wrap it up, I'll be there supporting the Glens, I've been a fan all my life. Some players who have been dropped for instance, can sit in the stands and end up having a go, even from the stands and quite openly, at their teammates, if they make a mistake. I disagree with that, it's a poor approach. I don't believe in a united front for the sake of it, the unity should be there, it's a team game and you should support your team-mates. Q. How about that bromance you have with Steven Gordon… Is he your best friend at the club? A. I could share a few stories about Stevie, not sure which would be fit for publication, however! Stevie is great. He's a smashing lad, and we have been tight for many years. We broke through at the same time and our girlfriends, Amy and Anna, are close friends as well. We've been to New York and Mexico together. I get fed up with him sometimes, it's hard not to with Stevie's sense of humour, but he's a great lad. Willie Garrett with Glentoran team-mate Steven Gordon. Q. Do you think Glentoran are on the right road this season, or do you still feel as if it's a period of transition? A. I think what they've done this year has been very good in terms of trimming the squad to bring some quality in, rather than panic-buying, or bringing players in at the wrong time. Ronnie had to let a lot of boys go but our squad was huge, there were about 30 of us, as big as Linfield's but in terms of quality not as good as Linfield's. He is ruthless but that's why he's been successful. It's funny, because for years I thought Ronnie was a hard task-master, but he's actually very easy to get on with. I remember in the 2015 Irish Cup final, when he was managing Portadown, he was furious with a so-called trip I did on Michael Gault… Okay, so I got away with that one, but at the time he was fuming. He never made eye contact with me when we went to Portadown after that, and I thought he had my card marked, but he's actually very down to earth which I never thought he would be. He's very good at getting a reaction, I think he'll be a success.